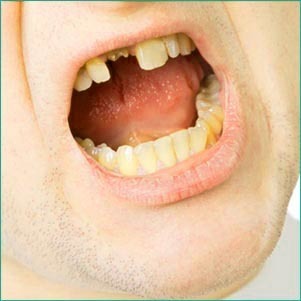 Decay – A broken or cracked tooth opens up the door for cavities and decay to set in. Pain – A break can also expose nerves causing pain when you eat or drink hot and cold foods and beverages. Difficulty eating – It can be difficult to eat or chew properly, impacting your digestion. Oral injuries – The sharp edges of a broken tooth can cut soft surfaces in your mouth, adding to the risk of oral infection. Appearance – Broken teeth have a big impact on your appearance, making laughing, smiling or meeting new people uncomfortable. Dental bonding is typically used on front teeth that have small cracks or chips. Santa Monica dentist Dr. Ana Brightleaf cleans the tooth, roughens the edges, applies an adhesive and, finally, the bonding material. The bonding material is then shaped and hardened with a special light. Fillings created from plastic tooth coloured material can repair small breaks in molars. The hardening and shaping process is similar to that used in bonding. If a large portion of your tooth is broken, or if there is significant decay, a dental crown that covers your entire tooth is the best remedy. Dr. Brightleaf will remove any decay before the crown is cemented in place. If an entire tooth is missing, a dental implant can replace it beautifully. A dental implant consists of a titanium screw (or implant) that is placed into your jawbone. By a process known as osseointegration, the titanium implant fuses to your jawbone. Topped with a dental crown, the result is a brand new tooth that’s as strong and attractive as your natural teeth. Constructed from plastics that do not contain BPA, the dental restorations we use at Brightleaf Dental in Santa Monica contain no metal. Being a holistic dental practice, we stay away from unnatural, harmful products as much as possible. We don’t use metal in our dental restorations because it oxidizes, breaks down , doesn’t bond to the the tooth’s surface, and can cause allergic reactions. On the appearance side of things, dental restorations made with metal are not as attractive as pure porcelain.